A recent Computer Science for Cyber Security (CS4CS) program at the NYU Tandon School of Engineering brought together a group of high school women for three weeks of training in the fundamentals of cybersecurity. Nearly 50 students attended classes at the downtown campus of the university, where they learned about programming, computer architecture, careers in computer science and cybersecurity and how to do professional networking. Now they're expected to return to their schools and serve as "computer science and cybersecurity ambassadors" and recruit a team of classmates to compete in Cyber Security Awareness Week, Tandon's annual cybersecurity competition. The program is led by members of Tandon's Department of Computer Science and Engineering and the Offensive Security, Incident Response and Internet Security (OSIRIS) Laboratory. During a day spent with sponsor financial services firm Depository Trust and Clearing Corporation (DTCC), participants met with myriad experts to learn about the general topics of computer science as well as emerging technologies. During one talk, DTCC's managing director and chief technology architect, Rob Palatnick, covered blockchain and cryptocurrency and spoke about distributed ledger and its impact on the financial industry. As he told the students, they faced "great opportunity" to "shape the future" of those technologies. "The same way our phones have become so much more than its initial purpose, we can expect distributed ledger technology to serve as a platform for innovation in the next five years or so. This is exciting because all of you will have the opportunity to investigate this area and help shape the future of these maturing technologies." 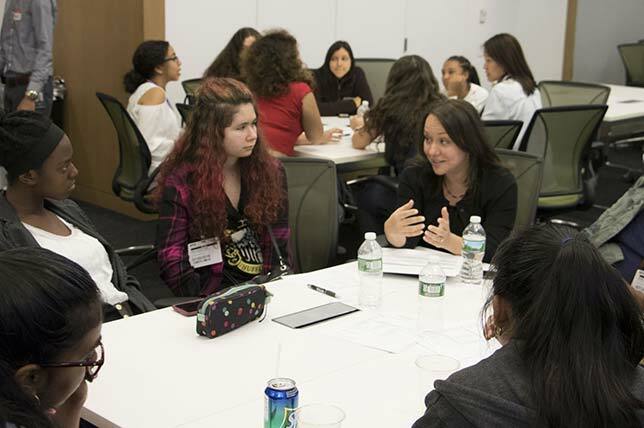 Dan Varela, threat management associate and cyber incident analyst, encouraged the young women to take advantage of the shortage of talent in the IT security field. "Of the current positions filled, only 11 percent are filled by women, which means there is an even bigger opportunity within cybersecurity for a majority of this audience," he said. "Companies want to diversify their workforce and gain new perspectives within this area. You have a great opportunity, so continue to learn and grow." Tandon sponsors numerous summer-time activities. In June almost 300 middle school and high school students partook of half a dozen programs. Almost six in 10 were female students. Activities took students into numerous campus labs, including those doing research on soil mechanics, mechatronics, biomolecular engineering, genomics and molecular anthropology.